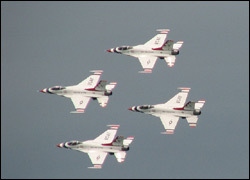 The headliners for the 2011 Chicago Air & Water Show are the United States Air Force Thunderbirds. The Thunderbitds fly the F-16 Fighting Falcon, the aircraft they have used to thrill airshow goers for more than 25 years. Throughout their demonstration they show off the performance of the aircraft and their skills in precision aerial maneuvers. The six aircraft demonstration team often splits much of their performance between four aircraft maneuvers and solo or opposing aircraft maneuvers. In the four airplane diamond formation Thunderbirds 1-4 will fly with their wingtips separated by as little as a foot as they perform rolls and loops. They will alternate showing off for the crowd with Thunderbirds 5 and Thunderbird 6 who perform solo and opposing manuevers that include high speed passes, slow and low passe, rolls, flying mirroed with one aircraft inverted above the other and various opposing passes. Thunderbird spends the majority of the show inverted, so the U.S. Air Force have painted the number on the plane upside down so it will be upright for most of the show. In Thunderbirds are comprised of 12 officers and 120 Enlisted Air Force members and they perform at more than 70 airshows worldwide each year. They are based at Nellis Air Force Base in Las Vegas, Nevada. They typically perform in Chicago every other year alternating with the U.S. Navy Blue Angels. Members of the Thunderbirds serve two-year assignments with the squadron. So pilots that have the honor of flying for the U.S. Air Force Thunderbirds only perform once for Chicago in their Thunderbirds career. Expect to see the Thunderbirds roar overhead for the first time on the morning of Thursday, August 18th enroute to Gary International Airport. They will also likely perform a site inspection on Thursday afternoon and may practice several of their maneuvers. On Friday afternoon you can expect a full dry rehearsal of their weekend show. They will then be the final act on both Saturday and Sunday starting around 3:15. You can learn more about the Thunderbirds on their website, twitter and facebook.